Uppumavu, as the name suggests is an amalgam of two words uppu (salt) and maavu (flour). 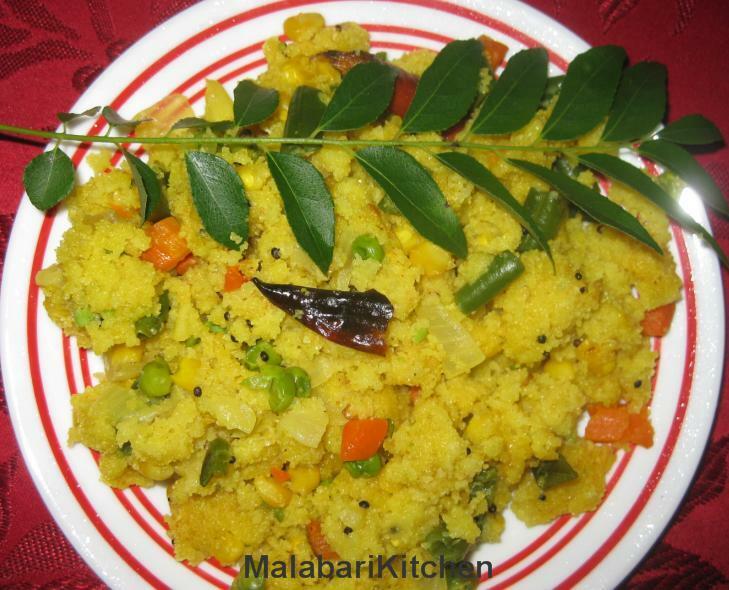 This is a south Indian breakfast dish. It is a favorite among housewives as it is easy to be made. =►Dry-roast rava until it just begins to turn brown, then keep aside. =►Heat oil in a pan and fry cashew nuts keep it aside for garnishing. allow them to splutter. Add moong dhal, dry red chilly and curry leaves. =►Now add Grated ginger and garlic. Sauté for 2-3min. =►Add sliced onion and green chilies and sauté till the onions become tender. =►Add mixed vegetables and sauté for 2-3 min. =►Add two cup of water, turmeric and salt . Allow it to boil. =►Then slowly add roasted rava into the pan stirring continuously. =►Mix quickly to avoid lumps forming. =►Garnish with grated coconut, fried cashew nuts. note:- If you are in a hurry and have to serve breakfast immediatley then you can remove steps 2 & 6. For a less calorious food remove adding ghee and cashews.